Each customer is provided a Certificate of Recycle for meeting documentation requirements in government or other contracts. Innovative Recycling can provide accurate accounting by weight of cartridges received by customer. Mass balance data can be provided on each batch of processed material including yields of raw materials by type. Innovative Recycling maintains a competent staff of experienced engineers ready to help with special problems. Innovative’s logistics staff can assist you with transportation and packaging needs. Q. Do you pay for toner cartridges that you recycle? A. The processes required for safely handling toner cartridges are more costly than traditional recycling processes, and therefore the output streams of raw materials do not completely cover the cost of the processing. Therefore, there is a charge for recycling. Q. What is the hazard with recycling toner cartridges? A. The toner powder is considered an explosive dust like grain dust and other organic powders. There have been many industrial fatalities involving companies who have not understood this hazard. Q. How much do you charge for recycling toner cartridges? A. Pricing depends on volumes and condition, but generally averages between $.25 to $.50 per pound. However, even lower costing may be possible for high volumes. A. The customer pays shipping. However, we have a competent logistics staff that can assist with optimizing rates for various scenarios. Q. Is there a minimum volume required? A. There is no minimum volume, however less than full pallets would increase shipping costs. Q. Will you accept Ink Jet Cartridges? A. We are in the process of adapting our patented process to include Ink Jet cartridges and expect to have this capacity on line by the year end 2010. Pricing has not been finalized for Ink Jet recycling. Q. What kind of data do I get as assurance to my customers of recycling? A. We provide a certificate of recycling with each shipment processed. With sufficient volume we provide mass balance information broken out by raw material yields. Q. What if there is material other than laser cartridges mixed in with the shipments to you? A. 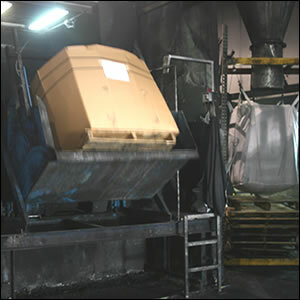 The process is highly specialized and can not accommodate general trash or higher levels of electronic gear. If we need to screen incoming shipments it will add to the cost of processing. Q. Is there a problem with mixing color and black cartridges? A. No they may be mixed in any ratio. Q. Do you have any restrictions as to the size or weight of cartridges? A. No, we handle all types without distinction. Q. Can you handle cartridges without toner as well as full of toner? A. Yes, there is no problem with either. Q. Can you handle incomplete or damaged cartridges? A. Yes, but there may be problems with shippers if your containers are not secure or are leaking toner or cartridge parts. Q. Can my customers send cartridges directly to Innovative Recycling? A. Please contact us directly for interest in this option. We would need to know what kind of customer and product data you might need along with logistics specifics etc.